These 6-ounce cups are just right for lungos, and of course, look great with a fresh cappuccino swirling around the glass. Mmm. These come from Nespresso, so you know the quality is there. Tempered glass cups, stainless steel saucers. Both are dishwasher safe, but not microwave safe. Also, we’ve been told that the stainless scratches easily, so if you wash by hand, don’t use an abrasive scrubber. Revol coffee cup looks plastic but it’s not! You’ll love this eye-catching, French-design coffee cups! They look like a crumpled plastic cup, but they’re actually dishwasher-safe Porcelain. Several colors available, so stack these up for conversation pieces before serving, and keep the conversation going serving your favorite Nespresso lungo in one of these. The size is just right: Each cup holds 6.25 ounces — so this is best for the lungo lovers who like the stronger version, closer to the factory setting. And, at 3.25″ tall, they’ll fit under your Essenza spout, no problem! 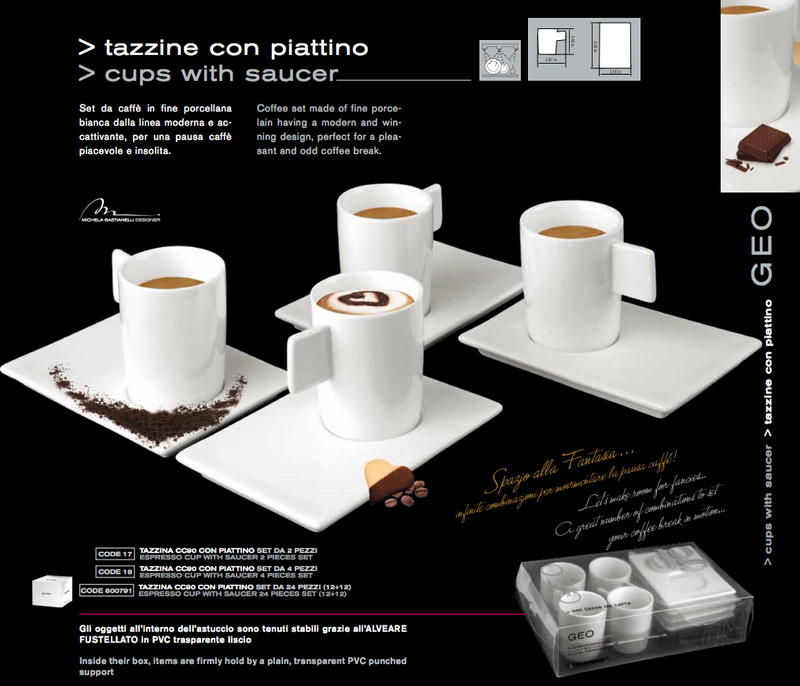 LaCafetiere says these cups are 3.5″ high, which is just, just the maximum height to fit under an Essenza spout. The 6-ounce version is a good size for a Nespresso lungo, which is factory set for 3.75 ounces, especially if you re-set your machine to add just a little more water! A set of 2 of these double-walled, glass cups are from Amazon, where reviews indicate that this is an “excellent” cup. Set of 2 — Order now from Amazon.com. If you know coffee, you know Illy, and if you know Illy, you may know about the “Illy Art Collection,” which regularly introduces a limited line of espresso and cappuccino cups, like this set designed by Michael Lin. This floral collection is signed and numbered by the artist himself. In this cup collection, you’ll get six handleless cups, each with a different floral saucer, so as a set, you’ll have a bouquet of coffee! These cups are featured here because they are 2.25″ tall and hold 6 ounces — a perfect size for a Nespresso lungo! Of course, they also are perfect for small, European-sized cappuccinos, as that’s Illy’s intent. Lin’s art typically features floral motifs inspired by Taiwanese textiles, and often is architecturally focused. The YouTube video below shows a nice interview with Lin and features some of his large pieces of work, as well as his inspirations. Here’s a set of lungo mugs made just for Nespresso fans: each features a lungo blend. So, when you’re in the mood for a Fortissio, no problem. Finezzo? Got it. There’s a mug for each of the four lungo blends, so if you get them all, you’ll have a set that’s ready for each of your lungo moods! The design is a classic coffee-shop blackboard motif with chalk-like writing and drawing — and, of course, the lettering is color coded to match your pods! The message is printed on two sides of the cup. Since this is from Zazzle, you have the opportunity to customize this mug, if you’d like. When you click on the images below, you’ll be taken to Zazzle where you can change the words on each side. So, maybe you’d like to make the message more personal… something like: “Mike’s Favorite: Fortissio,” or “For After 7 o’Clock: Decafeinato.” You decide, or just keep the cups as is. Each mug is hand printed by Zazzle.com, where you’ll receive excellent customer service. Microwave and dishwasher safe. Order individually for the set. Click on the each cup below to order.